About this Sunny Side Utility Pouch:75GSM non-woven polypropylene. Zipper closure. Hand washable.Material: 75GSM Non-Woven Polypropylene. About this Pocket Travel Pouch:Travel pouch with zippered closure.Includes metal split key ring with UltraHyde strap.Material: PVC.Special Instructions:1 Day Rush, available upon request for 1 color, 1 imprint location orders. About this Tees - N - Things Pouch:Tees-N-Things Pouch has room for accessories and a convenient clip. Metal carabiner can be easily clipped on golf bag. Materials: Sanded PVC (polyvinyl chloride) vinylSpecial Instructions:Rush Service:The standard imprint method, 1-color/ 1-location is available. About this Single Pocket Coin Pouch:Here's a promotion worth investing in!This single pocket, zippered suede-touch pouch coin features a key ring that tucks inside for safe keeping.The back contains a corresponding color for a decorative feel.It's a great size to throw in a pocket or purse while you're out and about.Ideal for financial themed promotions, each pouch can be custom imprinted with your name or logo for maximum branding exposure!Material: PlasticSpecial Instructions:Rush Service:May only be used on regular web quantity orders and one color imprints. About this Double Pocket Coin Key Pouch:Put your money where you logo is-imprinted onto this promotional pouch!The driving force behind your next campaign, this suede-touch pouch features two zippered pockets for coins, credit cards, ID, ATM cards and much more.It also contains a key ring that tucks inside one pocket to keep them secure.Offered in several colors, the front of the pouch can showcase your logo.Please note that the back of the item is blank.Material: PlasticSpecial Instructions:Rush Service:May only be used on regular web quantity orders and one color imprints. About this Pocket Piggy Coin Holder:Flexible materia.Squeeze open to insert coins.Great for fundraisers, financial services & tradeshows.Special Instructions:1 Day Rush: 1 color, 1 location. PMS color matches are not available with 1 Day Rush. 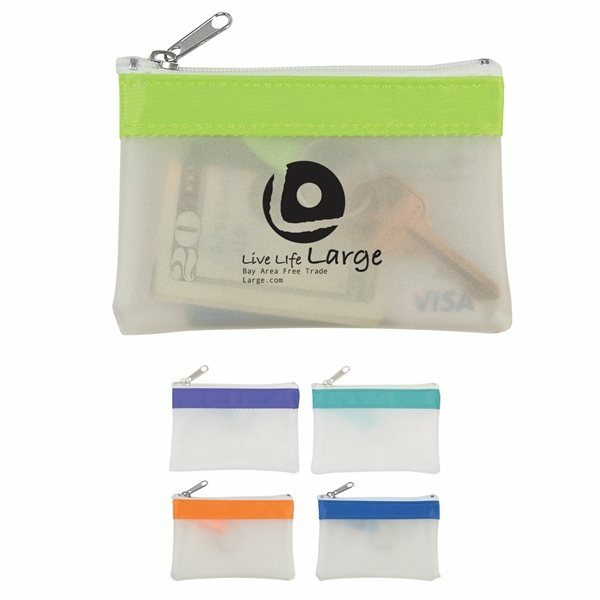 About this Large Zipper Pouch Storage Pouch Bag w / Plastic Hook:Perfect for travel or for carrying chargers, earphones, makeup, coins, keys, credit cards and cash.﻿Material: 420D Polyester for Blue and Red bags Clear Vinyl for Clear BagSpecial Instructions:2 Day Rush Service: 1. Printing 1 color / 1 location only.2. Epoxy dome, sand etch, personalization's and heat transfer are not available for 2 Day Rush Service. About this Coin Key Pouch Translucent:In need of a "change" for your next marketing campaign?Put your logo where their money is with the Palomino coin/key pouch with key ring that conveniently tucks in for safe keeping.Made of vinyl, this single pocket, zippered pouch is offered in several translucent colors to meet your branding needs.It's a great size to throw in a pocket or purse while you're out and about.Material: VinylSpecial Instructions:Rush Service:May only be used on regular web quantity orders and one color imprints. About this Waterproof Storage Case:Protects valuables while near water.Includes rugged lanyard.Secure snapping latch. NOTE: Product comes with Prop 65 warning label. Label reads: "WARNING: This product may contain carcinogen, which is known to the State of California to cause Cancer and Reproductive Harm. For more information, go to www.P65Warnings.ca.gov. About this Clip n Go Bag:Easy slide closure. Handy clip. Multiple uses. About this Waterproof Pouch With Key Ring:Here's a terrific item to help "seal" your campaign with success!This water proof pouch with key ring makes a handy giveaway during promotional events.This press and seal waterproof pouch protects your ID, fishing license, or other personal items.This marketing tool is made with recycled material and proudly made in the U.S.A.Add your company's logo for an excellent opportunity to promote your business.Material: Vinyl NOTE: Product comes with Prop 65 warning label. Label reads: "WARNING: This product may contain carcinogen, which is known to the State of California to cause Cancer and Reproductive Harm. For more information, go to www.P65Warnings.ca.gov. About this The SAFARI Classic Zip Pouch with Key Ring:Our NEW zippered key ring pouch has a classic look. It is small enough to keep in your pocket or purse. Plus the key ring strap attached inside the pouch which keeps your keys secure. You can order from 4 great New Classic solid colors. This item can only be printed in silver or gold. About this Two - tone Polyester Zip Tote with Carabiner:Two-tone 600D polester zipper tote with 50mm carabiner clip - Empty CaseMaterial: 600D PolyesterSpecial Instructions:Rush Service:Rush Service prices are for one color imprint only, standard ink colors. Multicolor imprints, halftones, additional location imprints and PMS matches will require an additional 1-3 working days. About this Zippered Pouch:Zippered pouch with keychain. About this Doctor Nurse Clear Pouch:0.3mm PVC clear pouch featuring doctor and nurse medical stock art pre-printed on front . Features Zip locking closure. Small aluminum carabiner attached (approx. 1.45"l)!Special Instructions:Rush : 1. Catalog quantities only.2. Valid only for the standard number of imprint colors/positions included for each item. About this Clip n Go Bag, Full Color Digital:Easy slide closure. Handy clip. Multiple uses. About this Plastic Container:Unfilled container.Waterproof plastic container is available with rope or lanyard(lanyard add $1.00 C each). NOTE: Product comes with Prop 65 warning label. Label reads: "WARNING: This product may contain carcinogen, which is known to the State of California to cause cancer, birth defects and other reproductive harm. For more information, go to www.P65Warnings.ca.gov. About this Plastic Pocket Tote:Unfilled container. NOTE: Product comes with Prop 65 warning label. Label reads: "WARNING: This product may contain carcinogen, which is known to the State of California to cause cancer, birth defects and other reproductive harm. For more information, go to www.P65Warnings.ca.gov. Thank you Juan, Daniel and Natalia! We’re glad to read your positive reviews. We always make sure our custom coin holders are delivered just they way you want them! The Pocket Travel Pouch is a great promotional item for everyone! Why not help your customers keep their coins safe and organized in a travel pouch. There are so many reasons to get this travel pouch, because coins aren’t the only thing you can store in here. This pouch allows you to store any little items you want-making travel much easier. Travel pouch with zippered closure. 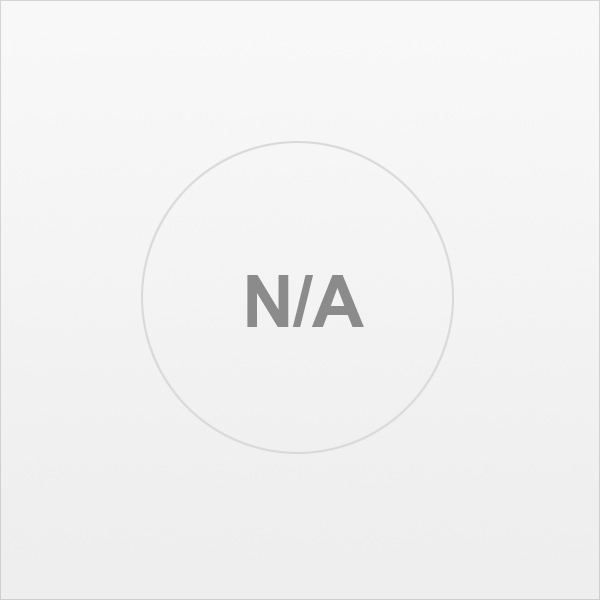 Includes metal split key ring with UltraHyde strap. Thank you Reagan and Valerie! We know this is a top seller because of the professional look it has. 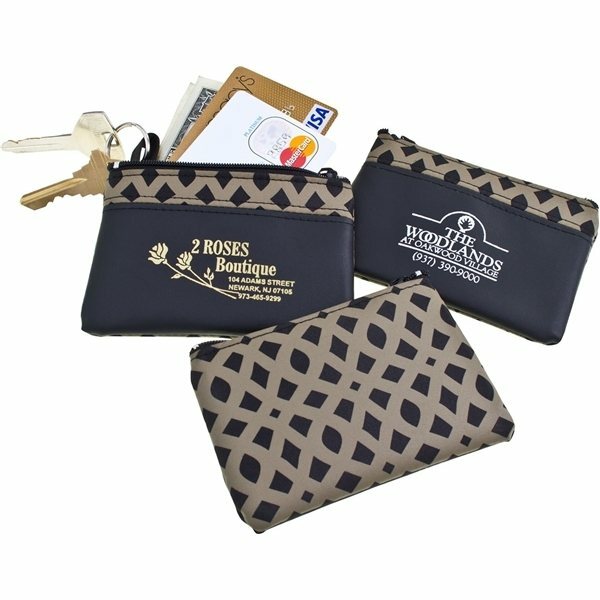 The Bronze Weave Zip Purse w/Keyring is a great promotional coin holder. It’s one of our top selling coin holders because of its style. Don’t slip away from this promotional coin holder. The Bronze Weave collection-patterned microfiber stitched to a finely-textured black vinyl. Pouch neatly stores coins, cash, parking stubs, receipts, ATM/phone/credit cards, loose papers. Thank you James and Genea! We’re always aim high when it comes to imprinting. Your logo is just as important to us as the product! Available in royal blue trim, pink trim, lime green trim, teal trim, yellow trim, purple trim, and orange trim. Order your Zippered Coin Pouch here. With plenty of custom coin holders in our selection, you’ll make marketing make cents with any of our options! We have travel pouches, squeeze purses, zip purse, plastic containers, and more! Looking for a specific color? We have many available in our selection. Promotional coin holders are great to carry change. Many times, we’re all left with unwanted change, but sooner or later coins come in handy. Our coin holders will help you with all parking situations; when you’re digging for coins for your parking meter, you’ll be thankful to have a coin holder! We have many different styles of coin holders available in our selection. Choose the perfect one to represent your company. Look through our selection of promotional coin holders. Shop here! At AnyPromo, we place a high standard on brand impact, just like our customers. Search our site for a wide selection of custom office accessories, and see for yourself. Trade show and event guests are bombarded with boring branded swag at every moment, so it is extremely important to stand out. Our custom coin holders are specially priced and proven to generate impressions. Click through our inventory of coin holders on sale now. The following list of hot items is a snapshot of our selection of 41 choices of custom coin holders. We’re ready to help expedite your order, so give us a call! Coin holders are great for any event. They are mainly convenient for metropolitan cities, because of parking meters! Many people wonder what coin holders are good for. When you need to pay with coins, you’ll have change on the tips of your fingers, rather than digging through your pocket or purse to find the specific coin you need. Our featured list of coin holders range from all different styles! Give your customers this promotional item that will help keep their coins all in one place.